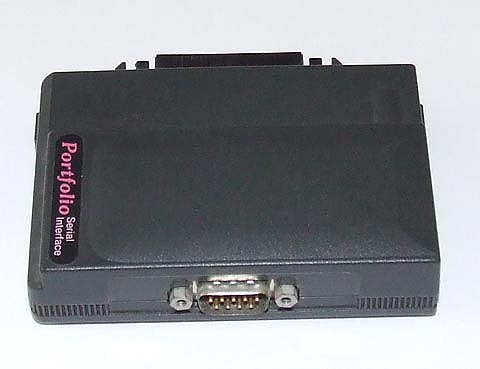 To receive a file sent by RS-232 using MORE.COM, on the Portfolio, execute “MORE FileName” (replacing “FileName” with the name under which to save the file). This will stream data from the COM port directly to the file (assuming no ^Z is encountered) WITHOUT locking up the keyboard! This allows you to advance the stream by repeatedly pressing Enter until the program automatically ends, signalling a complete transfer. It also means that you can still use CTRL+C if something goes wrong (something “COPY COM1 FileName” wouldn’t let you do, since it replaces all keyboard input with the COM port instead of simply opening it alongside). My Serial Interface hasn’t come through the post yet, so if someone with their own can test this for me, that would be great thanks! (In case anyone’s interested as to HOW MORE.COM manages to stream an input without locking up the keyboard, it seems to be through clever use of INT 21,45 and INT 21,3E. Google these for more information).